Brass instruments, such as French horns, require maintenance to ensure they produce high-quality sounds. When musicians know about the inner workings of the instruments and how the sounds are produced, they can maintain and repair their own instruments without the assistance of a professional repairman. For restringing French horn valves, the person should first understand where in the horn the valves are located. 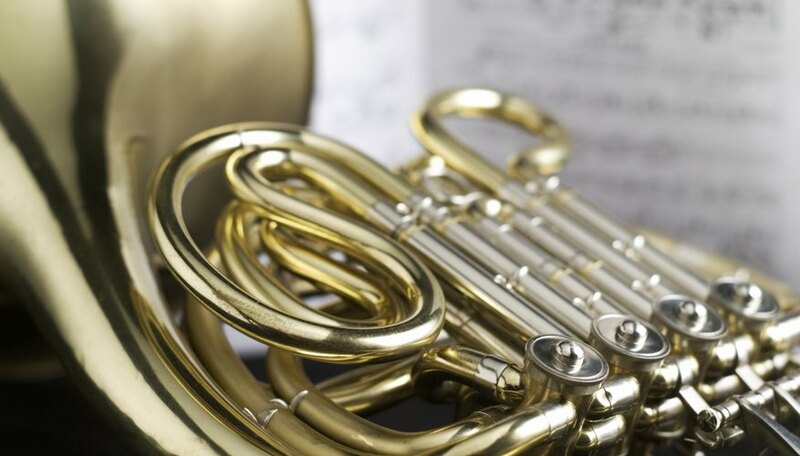 Attempting to maintain or repair an instrument without this knowledge could result in damage to the French horn. Locate the string screw on the outside of the rotary valve. The screw is on the upper section of the spatula arm. Unscrew the string screw with the appropriate screwdriver in order to remove the spatula arm. Loosen the multiple screws on the inside of the rotary value, which is what you see when you remove the spatula arm. The screws are small, so unscrew them gently and do not get them lost within the French horn. Reserve the screws on a working surface. Remove the old string. Access the end of the string within the rotary valve and pull it out gently. The string is wrapped around a rotating screw, so it should unwind with ease and pull right out. Cut a 5- or 6-inch piece of the fishing line for the horn's new string. Singe the ends of string with a flame from a match or a lighter, and then pinch each end of the string with the tips of tweezers. This singes the string at the ends so that they do not fray and are easier to maneuver inside the French horn valve. Tie a knot on one end of the string. Make the knot larger than the string hole on the side of the horn's valve. Reposition the stop arm by spinning it, with your thumb, toward the end of the horn's spatula. Place the untied end of the string into the string hole. By now, the string hole should be opposite the valve. Pull the string through so that it moves toward the opposite valve. Position the string so that it can move upward. Aim the string to go between the stop arm and the spatula. Loop the string around the cylinder. Push it down so that it is surrounded by the string screw and the rotor retaining screw. Loop the string around the string screw. Force the string back around the cylinder and pull it tightly around the cylinder. Use the screwdriver to tighten the string screw back on the stop arm. This keeps the intertwining of the string in place. Pass the string under itself to come back up through the string hole. This maneuver keeps the string from unwinding around the cylinder. A figure-eight knot is preferable for tying a knot on one end of the string because they continuously make themselves tighter, so they are least likely to come undone. For a figure-eight knot, look the string over and under in an S-shape. Thread the string through the first loop, moving upward, and pull it tight. The end result should look like the number eight.